A business journalist who spent more than four decades in the regional press has died aged 68. Tributes have been paid to John Cranage, left, who worked for newspapers including the Birmingham Post, Birmingham Mail, the Express & Star, Wolverhampton and the Reading Evening Post over the course of his career. For the Express & Star, John had stints as a district reporter in both Lichfield and his native Walsall, as well as working in Dudley for the Mail. However, he switched to concentrate on business journalism both as a staffer and on a freelance basis. 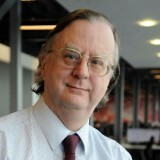 Birmingham Post & Mail acting executive editor Graeme Brown said: “John was a fine journalist and a beautiful writer. During his time at the Post, he showed a verve for writing often quite technical pieces in a way which engaged the his audience. John began his career on his hometown newspaper the Walsall Observer before moving to Reading. He returned to the Black Country in 1976 to work for the Express & Star, before switching to the Birmingham titles. He also wrote for Investors’ Chronicle. Former Birmingham Post business editor John Duckers, who wrote an obituary for his ex-colleague, added: “His copy was always diligent, reliable and comprehensive. You could throw anything at him and he would produce. John suffered a fatal stroke, and is survived by his sister Jane Wainwright. His funeral will be at Streetly Crematorium, near Walsall, at 10am on 9 December.